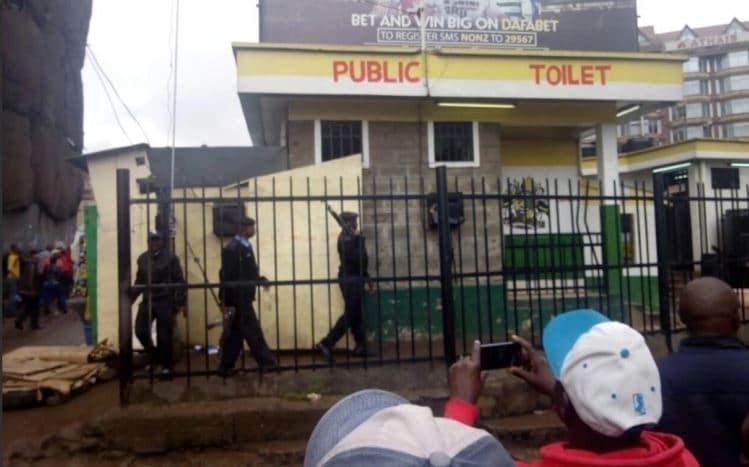 Police on Wednesday took over all public toilets in Nairobi, following a management dispute between a group of youths who had taken over the toilets and the Public Toilets Operators Association of Kenya. The officers were deployed to block youths who had taken over the management of some toilets in the CBD. The groups prevented access by those who initially ran the facilities. The deployment followed a court order obtained by the initial operators after the groups forcefully took over management in March. Public toilets at OTC, Muthurwa, Machakos Country Bus Station and Bus Station were affected by the standoff. “Goons took over these facilities illegally. That is why we went to court … police are here to remove them,” said Tom Makale, chairman of the Public Toilets Operators Association of Kenya. Two weeks ago, Governor Mike Sonko ordered the withdrawal of charges for use of the toilets and threatened to hire a firm to run them if the management wrangles are not addressed. “What Sonko emphasized on is that those involved in managing the toilets should cease the internal wrangles or else the Nairobi County Government will take charge and ensure that no one pays even a single shilling,” read the statement from Sonko’s office.